Drop and give me 20,000 (words)! Take Thesis Bootcamp as just one example. Dr Peta Freestone and Dr Liam Connell from the University of Melbourne, didn’t really invent the Thesis Bootcamp, but they did steal it creatively appropriate it in a rather special way. I watched Melbourne University Thesis Bootcamps at a distance, via social media updates. I noticed they’d drafted in Katherine Firth of the fantastic Research Voodoo blog. I started to experience FOMO (fear of missing out) asked Liam to come to ANU and teach me how to do it. Liam kindly took a weekend out of his time to come to ANU. I’ll be honest: I was still a bit skeptical at the start of the weekend. I thought pushing PhD students, who can be emotionally fragile at the end of their degree, to try to write 20,000 words in a weekend was a dangerous idea. The experience was amazing for me as an educator and the students loved it. They told others how great it was. Several people who had been contemplating quitting altogether actually handed in their thesis. FOMO kicked in again and students who missed out the first time around actually lobbied ANU for more. We’re now about to run our third one. When I started talking about Bootcamps on social media my colleague Dr Lizzie Towl had a FOMO attack and convinced me come to New Zealand this week to help her run the first Victoria University in Wellington Thesis Bootcamp where around 240,000 words were written. It’s 5:10pm on Sunday afternoon, and we’re watching 30 late candidature HDR students (mostly PhDs) from across the university. They all sit behind their laptops, typing with an urgency like they’re possessed. One of us remembers a George Orwell quote and writes it down on a piece of paper, silently hands it to the other, so as not to distract. We’re two minutes into our own Pomodoro break. A nearby student silently mouths the words she’s writing. The building could come down and she probably wouldn’t notice. ‘First for the 20k?,’ one of us writes back on the same piece of paper as the Orwell quote. We both smile and nod, knowing exactly what’s going on. 24:59, the timer reads. This is Thesis Boot Camp, and we’re down to the final leg of the weekend marathon. Thesis Boot Camp is an intensive writing program. It provides late candidature research students with support and a dedicated environment to help them make maximum progress on their thesis draft. It takes its cue from several ‘dissertation boot camps’ that have been operating in US institutions for years, from drop-in evening programs to summer-long retreats. But before the Melbourne School of Graduate Research began offering Thesis Boot Camp, a three-day intensive for late-stage thesis-writers had not yet been offered in Australian universities. One of us (Peta), who initiated and spearheaded the idea in mid-2012, was a PhD student in the final six months at the time and thus very in tune with what would assist in finishing that difficult first full draft of the thesis. Serendipitously, we both attended a weekend-based creative writing intensive as part of the Melbourne Emerging Writers Festival called ‘Down the Rabbit Hole’, and from these influences, Thesis Boot Camp (TBC) was born. Since then, TBC has been a success for MSGR, winning major teaching awards, and enabling hundreds of students to collectively write millions of thesis words. Other Australian universities are now beginning to offer their own iterations for their HDR student cohorts. It’s not an accident. We’ve seen it change lives. Here are a few reasons why Thesis Boot Camp works. Thesis Boot Camp is a place and space for writing. It’s out of the everyday office or lab, away from chatty colleagues and the gaze of supervisors. For some participants, TBC simply provides the much-needed peace away from family, friends and life responsibilities. But it’s also a safe space to talk about the journey and its struggles. To admit something’s not working. Why is this important? Most participants are in the final six months of candidature. Many are exhausted and keen for it to all be over. When their scholarship runs out and they’ve still got 4 chapters left to draft, they’ll try anything to get the thesis done. Enter TBC, where they’re immersed in a dedicated environment and encouraged to try a different approach to academic writing. This will resonate with anyone who’s ever been to a Shut Up and Write: when you’re surrounded by people who write, usually, you will write too. There is a silent accountability (your buddies can see your computer screen), but it’s more than that. There’s been some great discussion about the public performance of writing and its benefits (compared to writing alone)[i]. Our TBC comrade, Dr Katherine Firth, has an excellent blog where she outlines the four ‘phases’ of academic writing: thinking, writing, editing, polishing. Many students attempt this full cycle with every single sentence they produce. They think about a sentence, write it out, edit its structure, then polish it until it gleams, agonising over every word. Then they move into the next sentence. In so doing, their progress is incredibly slow—they’re lost in what Katherine calls the ‘perfect sentence vortex’. TBC is focused on separating these phases and challenging students to spend a weekend writing. Not editing. Not polishing. Not reading, note taking, planning to write, thinking about writing, cleaning their workspace in preparation for writing, or intending to write when conditions are better. Not doing everything subconsciously possible to avoid actually… writing. At TBC, everyone is supported to face the blank page. Generative writing is about getting into that ‘writing’ phase, and staying there until the section, chapter, whatever, is complete. Often at TBC, research students tell us that they feel lost in their data, research and ideas. To help participants focus their thoughts, Liam uses various types of Socratic questioning to get them to tell him what it’s about. Naturally, they tend to use a narrative structure to explain their core questions and the answers they’ve found to those questions. Sometimes just articulating this gets them out of that fog and they rush back to their laptop ready to write it out. We work hard during the program to convince students of the utility of the rough first draft. This is the ‘zero draft’, the draft that’s just for you, with no need to show anyone. The aim is absolutely not to come to TBC, write fifteen thousand words, open your email on Monday morning, hit ‘Attach’, and send it off to your supervisor. But, no matter how rough it may seem at the time, all the editing and fixing and correcting can come later, because you cannot edit a blank page. Students frequently find this process unpalatable, because they are used to producing good work. The very fact that they are there in the room as late-candidature HDR students means they are excellent students. As such, they can’t bring themselves to write a rough anything. So, they try to write a great first draft, which is the most difficult, slow, painful way to go about writing a thesis. We convince them to generate the words, then make them great. Greg Dening wrote that ‘we never learn the truth by being told it. We need to experience it in some way.’[ii] We’ve found that enabling research students to have a direct experience of what is possible when it comes to academic writing is empowering. It is wholly insufficient to say to students ‘you can write your thesis in three months’ or ‘you can write 10,000 words of your manuscript in a day if you just really apply yourself.’ Instead, we tell students we want them to be able to write their thesis confidently and with authority, but they first need an experience of doing so, in a supported environment. We encourage them to stop writing like research students—and here we defer to Dr Katherine Firth again—and to start writing like academics. We want them to write like their supervisors write: ‘bash the bloody thing out, then fix it up later’. At TBC, HDR students have the time, space and support to experience the transition between writing like a student and writing like a professor. In summary, we have two clear objectives for each TBC and every group that goes through it. The first is that participants achieve the specific goals they set for themselves, ie: the chapter/s they want to draft over the weekend, the outcome they’re working toward. The second objective is that they have at their disposal an alternative approach to academic writing that can be applied to whatever project they’re working on, from the thesis, to publications, to progress reports, grant applications, and more. That academic writing is not the overwhelmingly long, painful process it is for so many students who get stuck in the perfect sentence vortex. We have found that the best way for this approach to stick is for them to experience for themselves how it works over a sustained period of time, alongside a supportive cohort of peers in a ‘third space’ environment. At the end of the program, ideally the two come together, they’ve got a sense of how this approach to academic writing works, and they have the results (being the chapters they wanted to write) to prove it. More information about Thesis Boot Camp at the University of Melbourne can be found here. Dr Pete Freestone runs Thesis Bootcamp in the UK, more details on her website here. If you are an ANU student, you can find more details about how to be involved in Bootcamp here. [i] Mewburn, et al, ‘Shut Up & Write! : Some Surprising Uses of Cafes and Crowds in Doctoral Writing’, in Claire Aitchison, Cally Guerin (eds), Writing Groups for Doctoral Education and Beyond: Innovations in Practice and Theory (Routledge: London, 2014), pp. 220-2. This entry was posted in Getting things done, On Writing and tagged bootcamp, productivity, trouble, Writing. Bookmark the permalink. Oh My God – can someone please create one of these for marking student papers??? Pretty please?? PS this is purely wishful thinking – I do realise it wouldn’t work for marking papers, and I do understand the purpose of the actual thesis boot camp exercise. But still, HOW NICE WOULD THAT BE… clearly I’m in the midst of marking mania… (which is why I’m reading blog posts – obviously). I would do these at my previous university. A dozen of us grad students and professors would meet at 9am, lock ourselves in the room, and become a unified written exam-marking machine until we finished. Lunch was ordered in. Depending on class and exam size, we’d be done at 1pm at the earliest, 5pm at the latest. It was mentally exhausting after a few hours but being able to chuckle at funny or bad answers with the whole group, and the sense of being in it together, made time fly by! Time for UniSA to jump on this idea I think! Thanks for this post. I can definitely relate! Although I’m only 4 months into my PhD, I know all too well that I am an expert at getting stuck in the ‘perfect sentence vortex’. I have been like this for years. A few weeks ago, I had to write my draft detailed research proposal. I began in my usual way – agonising over every word and sentence, and making sure I was meticulously referencing every sentence – and found I was getting nowhere fast. I needed to get this draft written to send to my supervisors before our next meeting, and I was running out of time. I had often heard about the idea of writing a first draft, but have never been able to do it. I figured that I had to give it a try because my usual approach was clearly not working and I have years of writing ahead of me. So, I forced myself to just write off the top of my head, forgetting about referencing, expression, etc – and to my amazement found that in less than an hour I’d written over 500 words explaining the background to my research project. I expected it to be utter rubbish, but when I read over it I found, to my compete surprise, that it wasn’t even that bad! It needed some editing and insertion of citations, but otherwise basically made some sense. I think developing confidence in this approach to writing ‘true’ first drafts is something that will take some time, but even with my first attempt, I already feel a bit more confident. My next writing task is to draft a thematic analysis of interview data collected for a separate project that I’m working on – I have been procrastinating and thinking about how hard this task would be, bacause I was thinking about writing in the old way (i.e., ‘perfect sentence vortex’). But after reading your post, it reminded me about my new way of writing ‘true’ drafts … so, today, that is what I’m going to do! For me, it is about learning to write in a new way. Rather than wait until I’m trying to write up my whole thesis, I thought I’d start this new approach with small writing tasks, to build the habit so I can more confidently and effectively take on the big tasks (i.e., thesis). Happy drafting everyone! Hi. I’ve been following this blog faithfully since I started my PhD three years ago, but this is my first comment. I just wanted to take the opportunity to say how much help and encouragement I’ve had from reading the blog over all that time, and how much fun too. This particular post is most timely. It has inspired me to face the fear and do it anyway. Or at any rate to try! I’m due to submit a full first draft in two months time, and I am so locked into the perfect sentence vortex that my productivity is practically zero. I tell myself just to get on with it and write something… and then I end up reading blogs instead because I can’t bring myself to write “just a draft” ,but I’m unable to get my ideas from brain to computer screen in a pure and readable state. For the first time in the whole PhD process I’m beginning to understand why some people pull out. Anyway, thanks for the good ideas, and the pep talk. Time to try again. Maybe THIS time it will all come together. 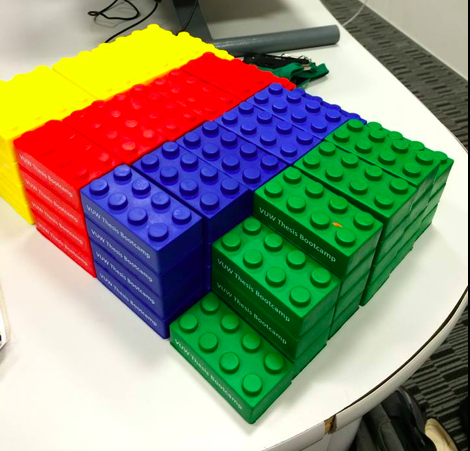 In the meantime, some information about the Lego blocks certainly seems called for! What a great idea, thanks for letting us know. I wish I’d had this a few years ago so I wouldn’t have waited to finish my thesis at the 11th hour! There is a free internet program called NaNoWriMo (National Novel Writing Month, http://www.nanowrimo.org) where people sign up to try to write 50,000 words of a first draft during the month of November. Last year they asked for a $10 donation to help cover their expenses. While most of the participants are novel writers, there is a “rebel” section for people continuing previous work (you’re on your honor to only count the words you write in November) or non-novels, or whatever. While the goal of NaNo is to write 50,000 words, nobody is going to hassle you if you write less or more. You could probably even start a thesis writers group on the discussion boards if you wanted to. At any rate, good luck on your thesis writings. I understand the ‘it has to be perfect’ trap. I use different font colours to get over this – red is first rough draft, green second, blue third and black my polished version. A piece of writing w.ill start out with chunks of red and or green depending on how rough I think the writing is, and then gradually get polished – this has helped me enormously. I love this idea, and have toyed with setting up something similar at my university. Do you work across disciplines, or have different camps for sciences and arts? And I’m dying to know what the Lego is for- prizes for reaching word milestones? Everyone who has done it so far has done at least 5000 words, even those who write like you do. There are no punishments for not succeeding, only encouragement, support and incentives. Sometimes I talk about Thesis Boot Camp, and you might wonder what I mean. Here are my team-mates, Peta Freestone and Liam Connell talking about it on The Thesis Whisperer Blog. Have read and re-read this post quite a few time now and followed the various links – now it’s time to bite the bullet. I’d like to get a Thesis Boot Camp up and running at my university. Who should I get in touch with to “share” resources? It seems the Melbs model is highly successful so I’m very interested in how it works!